Awesome! And you're so cute!! That is so cool! Did anyone take video? I'd love to see/hear you playing the harp. And I love the photo of the temple. We saw it when we went to Oahu about ten years ago - very beautiful. What a beautiful Temple! Thank you for sharing this with us. The San Antonio Temple has a beautiful, cascading fountain. Maybe you can come visit someday? 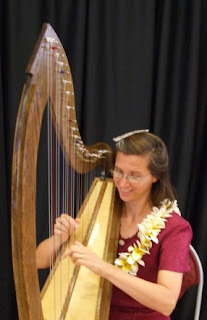 you look so great in your harp-playing photo - you just radiate the aloha of your new home ;-) Wish I could have been there to hear you! Jonene, if you'll go to http://gnomonkeep.org/harp/harpmus.html then you'll find some mp3 files of my playing. I should have had someone take video! I was all dressed up and that black curtain made such a nice backdrop. I hope to visit San Antonio again someday, Michelle. I used to live in Dallas and my high school choir would go there once a year for a choir festival. Mom-wish you were here too!